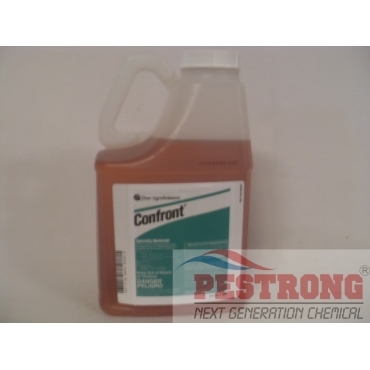 Where to Buy Confront Herbicide, Confront Specialty Herbicide Triclopyr - Gal - $149.95 for Sale with Fast Free Shipping! Confront Specialty Herbicide Triclopyr - Gal is a broad-spectrum weed killer for control of broadleaf weeds in established cool season and warm season turfgrass. By buying this product & leave product review you can collect normally 14 reward points as a voucher of $1.40(1%). Confront specialty herbicide is a non-phenoxy herbicide, Confront specialty herbicide is ideal for high-use areas including golf courses, parks, commercial grounds and other public facilities. Labeled for use on most established cool- and warm-season turfgrasses including Bahiagrass, Bentgrass, Bermudagrass, Kentucky Bluegrass, Kentucky Centipedegrass, Creeping Red Fescue, Chewing Fescue, Fescue, Ryegrass and Zoysiagrass. See label for complete listing. RATE: mostly 16 ~ 32 oz per acre per 100 gallons of water or 2.5 teaspoons ~ 4.5 teaspoons per 1 gallon of water per 1,000 sq.ft. In California, New York, Oregon and Washington, turfgrass and lawn uses are restricted to golf courses only. Do not use on residential turf. Do not apply to Bermudagrass on sod farms. Good wide spectrum for broad-leaf weeds. I use over buffalo grass. Negatives are it is slow acting and expensive. Worked very well on clover - even with moderate rainfall within 12 hrs of spraying. A bit difficult to tell how much to use in terms of oz/gal but since it depends on the sprayer and drive speed I guess it makes sense. With experience I could probably hone it in some. Pretty darn expensive stuff but 2,4-D just doesn't touch the clover.